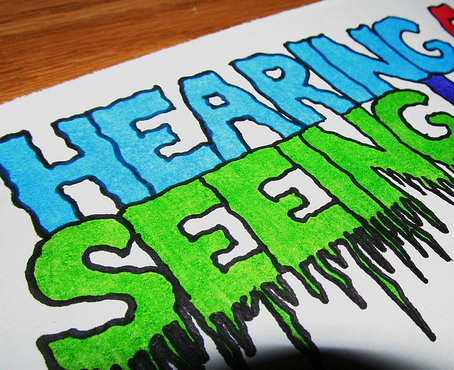 Hearing and seeing are two different things. Often hearing about a famine in Somalia will make us shake our head in disbelief with little real action. Being present and seeing children die through starvation will leave an indelible mark that will change our lives forever. Job is saying to God that this is the type of experience that he just had. Job was a good person. He was THE example of a God follower on the earth. He had heard about God and followed God. But what he is saying here, is that his God was too small. His God was actually much bigger than he had even imagined. His eyes had been opened to a new perspective of God and it was gigantic compared to his old view. He had seen a new reality of God. What stands out to me is the catalyst God was able to use to bring about this transformation in Job's view of God - Suffering. Today God has helped me to see that my view of God has been way too small and I have seen something of his greatness and character that I've never quite seen before. No matter what else is going on in my life today, because I have seen a little more of our sovereign God, today has been a good day.